When the European public of the 1920s imagined India, what did they conjure in their minds? Was it a realistic picture? Could it be? Certainly, most of them had never seen the place. Presumably, some of the filmmakers whose work the public consumed, had. But filmmakers, for the most part, seek to entertain. So when they set a film in India, they made this India the stuff of fantasy, with beautiful dancers and ecstatic priests, and heathen monuments hewn from rock, all of it encroached upon by jungles filled with terrible beasts. This place was defined by its otherness to the West. Its people were outsiders, even when depicted in their own land. 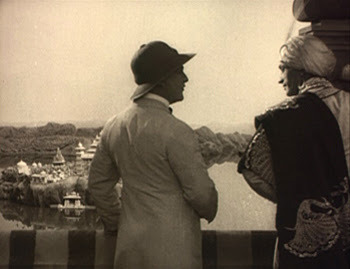 There were, so far as I know, no real Indians in The Indian Tomb, producer/director Joe May’s 1921 diptych about a white architect commissioned to build a new Taj Mahal. 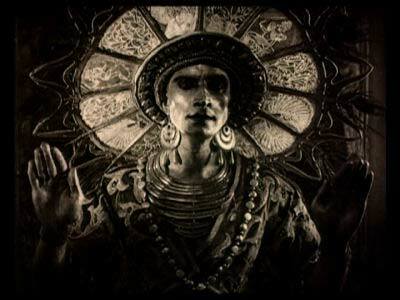 The Indian Tomb stars a selection of white actors, many of them in brownface, including Conrad Veidt, who plays its tragic antagonist, Prince Ayan. Set in Bengal, it was filmed in Berlin: a European movie, made for European and North American white audiences. The story, in brief: A fearsome but somber man, Ayan, prince of Bengal, wishes a tomb to be built for his princess, Savitri, whom he loves passionately. He wants a famed European architect, Herbert Rowland, to design it. Both Herbert (Olaf Fønss) and the Prince are eminent men for whom worldly power has proven unfulfilling. The prince’s need for the building meets Herbert’s need for a grand project, and so the white man travels to India to begin his work. Once there, he discovers that the princess, for whom he will build this tomb, is still alive. However, the film does not begin with the commission. It begins with the Prince’s discovery of a yogi, buried underground. This yogi, Ramigani (Bernhard Goetzke) has slid into a meditative state so deep as to simulate death. It is decreed that, upon being revived, this yogi must serve the one who revived him. However, he must also work to reveal to this man the futility of worldly desire. This is both sillier, and more thoughtful than it sounds. Silly, because the idea of a man surviving buried in the earth, without food, water, or oxygen, for years, is beyond belief. Sillier still, because the yogi emerges from his trance with literal super-powers, including clairvoyance, astral projection, teleportation, and telekinesis. And yet…one who possessed such a powerful servant would be tempted to abuse that power, wouldn't he? And the role of the prince, as crafted by the brilliant Veidt, is one of an already bitter and tortured man, standing upon the precipice of character, looking down. We suspect it will take little for the prince to do wrong, and we want to be there when it happens. And if there's a super-powered yogi involved, so much the better. Herbert, too, is challenged by the yogi in thoughtful ways. The yogi appears at Herbert’s home in Europe, telling him of the commission, expressing confidence that he will accept it even after he refuses—but warns him that to succeed, he must abandon his old life. Any vestiges of that life, and the desires they embody, will prevent him from realizing the “unborn child of his soul.” This may be the only thing in The Indian Tomb that remotely resembles real Hindu thought. 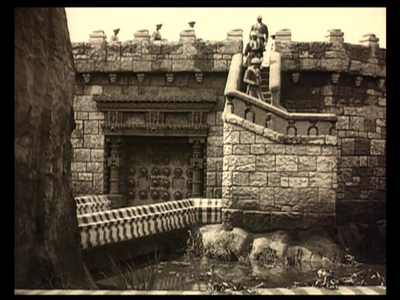 The Indian Tomb was scripted by the husband and wife team of Thea von Harbou and Fritz Lang, from Von Harbou’s novel. Yet May avoids the trap that Lang himself had fallen into with his own two-part adventure film, The Spiders (1919/1920): a stiff and plodding affair with an Oriental theme and too great an appreciation for its own visuals. In The Indian Tomb, scenes are brief, especially by silent film standards: May often cuts between two equally pressing situations to keep things moving. And indeed, they fly by. Only Griffith’s best work moves faster. The pace of the film also helps to hide one of its big weaknesses: the sets. Mostly bogus and cheap looking by today’s standards, I don’t think they would have impressed audiences in 1921 either. Not, at least, if those people had seen the Fall of Babylon, as depicted in Intolerance six years before. The sets never shake that backlot feel, and May only emphasizes this by framing them so tightly. Much better was yet to come from German silent cinema. Though its vistas fall short, The Indian Tomb’s special effects are a remarkable, if hokey, success. We see the yogi appear and disappear at will, cure the diseased, and make objects move when and where he wishes. Most memorably, he sends his own, disembodied hand to Herbert’s workshop to retrieve a letter the architect wrote to his fiance, Irene; that she might not follow him to India. One describes moments like these to someone else to spark their interest in a film. Wouldn’t you like to see these scenes for yourself? Irene (Mia May), proves no shrinking violet. She successfully tails the dreamy Herbert to India and stands up to the prince more courageously than he does. Her strength and resourcefulness is appealing to modern viewers. Yet I also appreciated the film’s determination to make her presence a negative—in the literal sense that Herbert, by interacting with her, dooms himself. She is her own person—in many ways more impressive than Herbert—but she is also a thing he loves from the life he left behind. The yogi did warn him. The Indian Tomb can be intoxicating. As a viewer, you try to keep a safe distance from it: You’re aware of its cultural freight, the problematic brownface, its zealous indifference to the truth about a country that is only alien if one wants it to be. Yet the plotting is good, and the action continuous. There’s a yogi with powers, and spectacular costumes and terrifying illnesses. Tigers and elephants—real ones, even if they come from a German zoo. And there’s Veidt’s acting—that marvelous, silent alchemy: inner turmoil morphing into outward pain through exquisite, long, angular gesturing. The prince, as played by Veidt, is a man to watch, and because of that, no rotten deed he commits in The Indian Tomb can cost him all of our sympathy. Veidt’s so good, he almost makes us forget that he’s a white German man in dark makeup. What were Europeans of the 1920s thinking of when they thought of India? Themselves, in it. But only until the lights came up. We must do better. The Indian Tomb, Part One: The Mission of the Yogi, and Part Two: The Tiger of Eschnapur, will play back to back this Saturday, November 14, at Toronto’s TIFF Bell Lightbox; part of the retrospective, Indian Expressionism. Fabulous review. This sounds like a film that is not to be missed, especially if Conrad Veidt is in it! There's another one I have to see. Your conclusion is beautiful and wise: "Veidt’s so good, he almost makes us forget that he’s a white German man in dark makeup. What were Europeans of the 1920s thinking of when they thought of India? Themselves, in it. But only until the lights came up. We must do better." Thanks, Conrad Veidt is one of the best actor of all time. Best and most beautiful. Hi, does anyone know where I can get a copy of this film - ideally Region 2 DVD or download?